In the creative life it's the seemingly innocuous steps that open up new worlds. As an artist business owner, I find it easy to get caught up in the creativity of the business and neglect my own studio practice. One of the ways I combat this is to periodically check in and ask, What work am I doing in my business that is getting my creative juices flowing, and is there a place for it in my art? 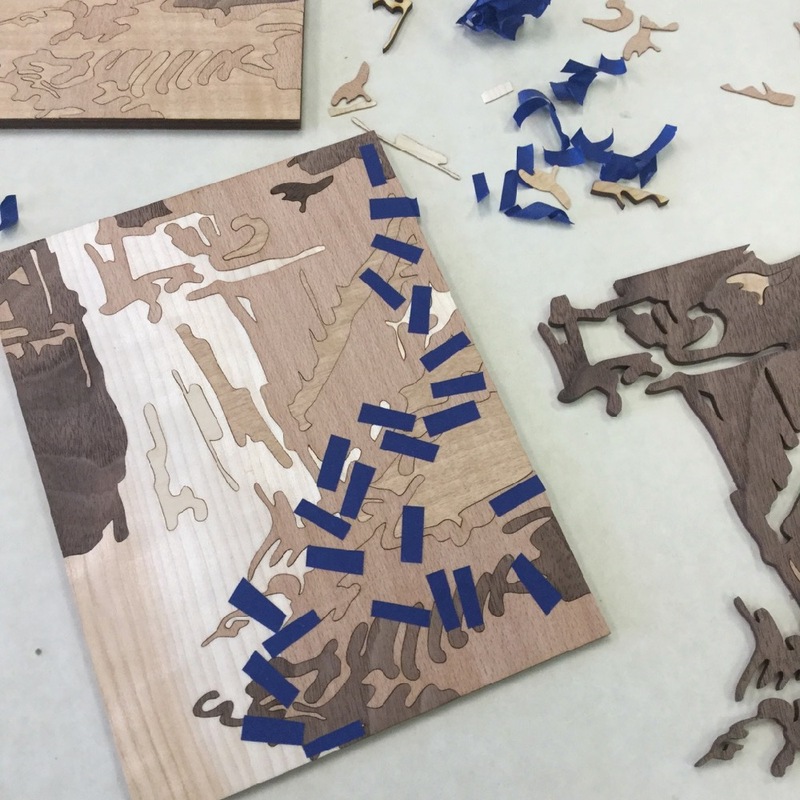 This month I will take you through how making 250 "The Great Wave" sample books for PaperSpecs inspired an inlay for my booth at the WoodenBoat Show, and ultimately got me thinking, Is there a place for wood inlay in my own work? It all started when PaperSpecs, a website helping graphic designers create printed pieces that WOW, invited me to create 250 sample books for their next VIP member boxes. How could I say no? 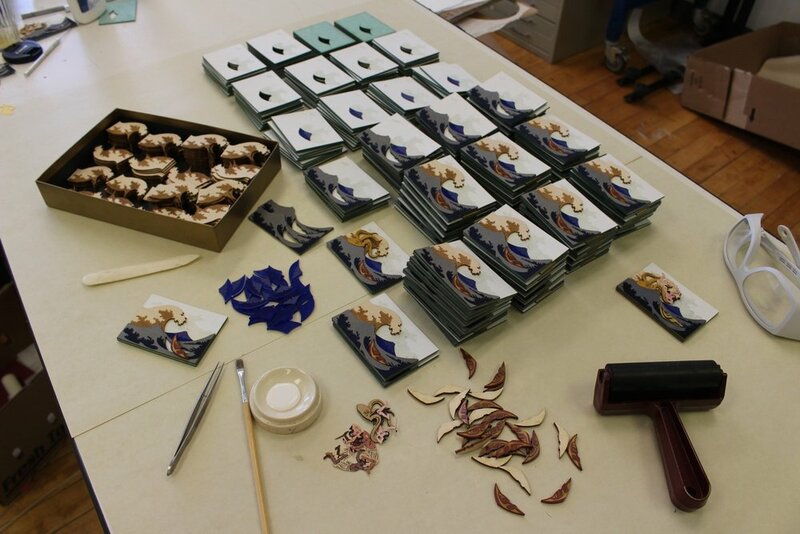 Producing 250 of these handmade pieces was no easy task. But once I made several design tweaks and streamlined the process, I began looking forward to the meditative assembly. When I asked myself, What about this project excites you? I realized that it was the mental puzzle of designing the integration of seven different materials into one tiny scene, and then the meditative zone I entered when putting the pieces together. Using a brainteaser's approach to creating compositions has long been a part of my work and can be seen here in earlier lithographs. The assembling would have been impossible without help from my friend Valerie and my Mom. My mother helping with assembly. Can you guess where I get my creativity? In preparation for the WoodenBoat Show in Mystic, CT this past June, I created several samples of laser cut inlay and marquetry to showcase FreeFall Laser's capabilities. Nat Benjamin, boat designer and builder of Gannon and Benjamin Marine Railway, graciously offered me the plans for his boat Charlotte to create a centerpiece for the show. Combing through a box of veneers and juxtaposing different colors and grain patterns, I found myself wandering again in a land of little pieces, where I had to be fully present with every action. At this time of year my personal studio practice is simply to draw as much as I can out in nature before New England's hunting season starts. Then, in the winter, I turn my drawings into prints. As the summer slips away, because access to printing facilities has proven a challenge, I've been wondering if I need to look outside of printmaking and find another way to transform my drawings. So I reversed my original question, asking myself, Is there a place in my studio practice for what excites me at work? I thought about the puzzle of composing interlocking pieces, my fascination with wood and processes that absorb me into a meditative state. Sketching on a hike (left). 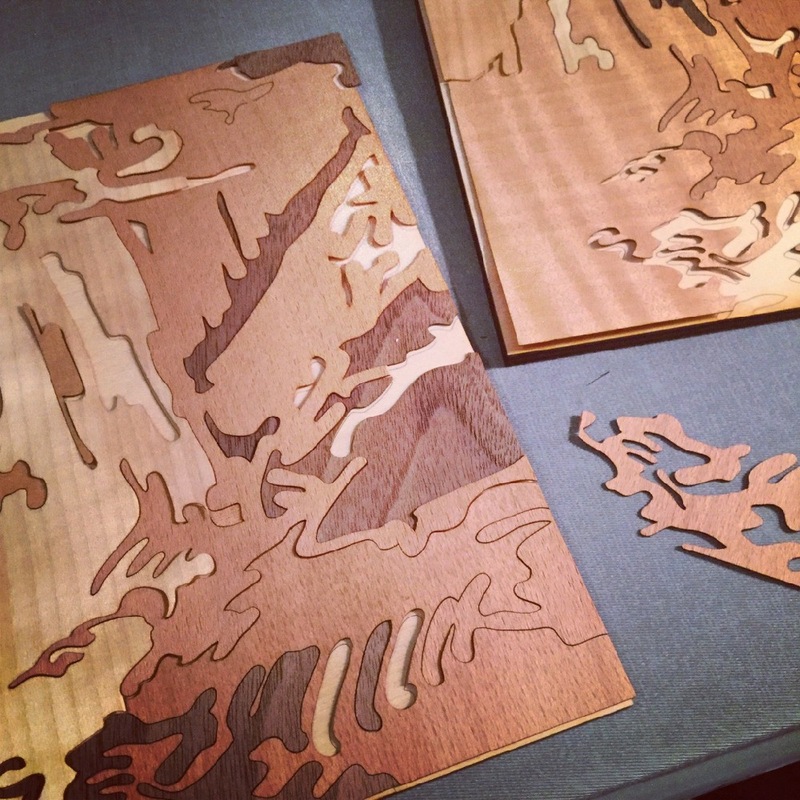 Spending my evenings arranging and rearranging tiny pieces of veneer (center, right).